Two weekends ago, my husband and I took an overnight trip to New York City. 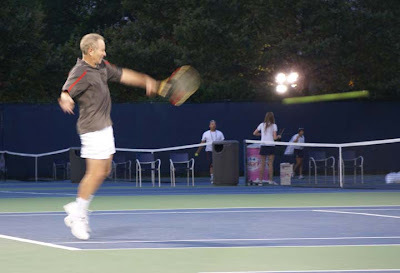 We went to the US Open last year and were able to get tickets again this year. My husband graciously suggested we could go to Mood while we were there. This is the fabric store to end all fabric stores. 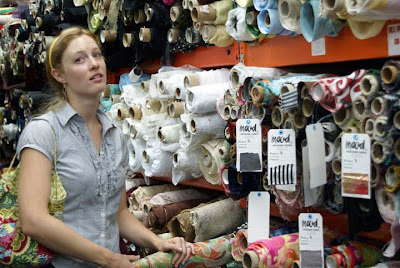 It's three floors of rolls and rolls and thousands of rolls of designer fabric. I was completely and utterly overwhelmed. I even went there with a project in mind and I couldn't put it together. There were just too toooooo many choices. I did end up getting a pretty tweedish fabric in purple and green and two drapey knit fabrics. Let's see what we can come up with! While I was wandering around aimlessly and wildly in Mood, Josh scoped out the neighborhood and found that it was teeming with fabric stores and notion stores. There were a few stores that pretty much just sold zippers and thread. Boxes and boxes of zippers and thread. We checked out Spandex House and a few more unique fabric stores, along with Parsons, the famous fashion design school. This section of New York is known as the "Fashion District." Check out the larger than life logo! We also went into M&J Trim where I was once again compltely overwhelmed. Floor to ceiling ribbon, applique, buttons, trims, sequins, purse handles, etc. etc. etc. Aaaaack! 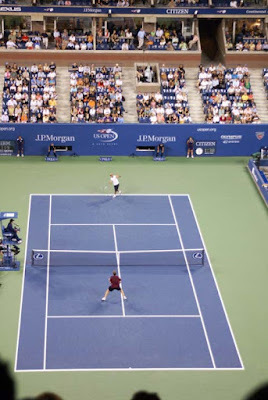 This is from the men's match we saw..... James Blake v. Mardy Fish....... Fish won. The next day we walked around Soho and ate breakfast at Dean and Deluca's which was a very European, crunchy granola grocery store. 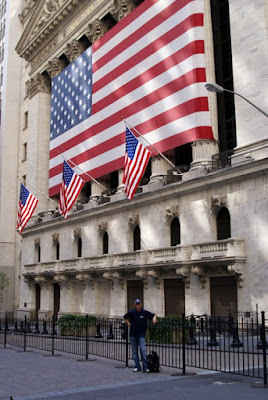 We checked out the site of the World Trade Center, Wall Street and the NYSE (slightly more manly than fabric stores, although we did go to one more - Purl Soho). 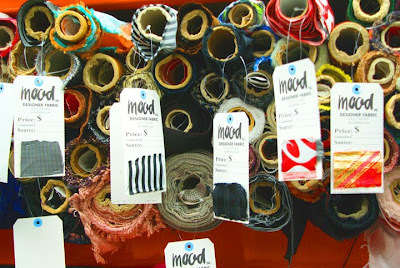 For any fabric-aholics like me, I highly recommend a jaunt to Mood, MJ Trim and Fashion District if you are in the area! But are there yarn shoppes????? Now that's what I call a trip of a lifetime! Well, maybe not in the way a trip to a scenic place would be. But I would LOVE to check out all those stores in the garment district. So is it difficult to get around? Do you take taxis, or did you do a rentacar thing? I would love to visit NYC during Christmas, go see Central Park, etc. I'm so glad you had such a lovely trip! that place is awesome.. wish I was there.. but they are millions miles away hehehe.. oohh i am a fabricholic too. Can't get any nice ones here in Malaysia.